About twice a day, my ladies get some free ranging time. How they spend this time is always quite different, but very predictable. Ruma still likes climbing on everything, mostly my kitchen area, which I have to clean every time I want to use it, but also the top cage (as it is currently not attached to the bottom cage because they once again gnawed through the tube), me, the bathroom or she will see if she can steal some goodies out of my hands or mouth. A picnic-basket filled with paper shreddings! pieces when I found it that I decided they could keep it like that. Lately this spot has once again become Koko’s favorite hide-out. She drags all the paper bags, envelops, receipts and other pieces of paper (like dried-up used teabags) into the picnic-basket to well… to what really? Today she was making more noise than usual and well, the sight of this kind of explains why. She does nothing other than shred the papers that she has collected in the basket. 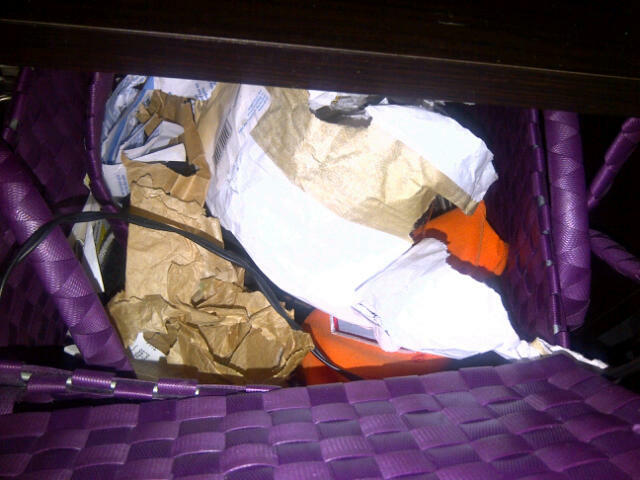 Luckily, all she has dragged in so far are scraps, receipts and old bags. Just imagine her taking my bills!! I need to put my mail away! She was also quite protective over her loot. 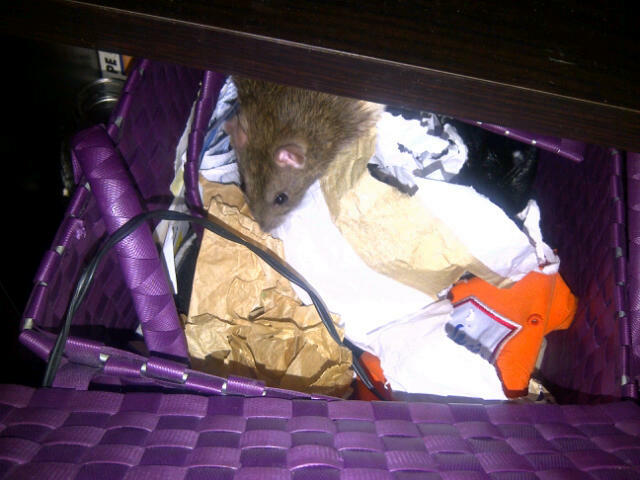 She instantly came out to see what I was doing with her carefully selected collection. Is all my paper still here? Don’t take my paper human! Yeah, protective Koko really came out. It was obvious she has spent many an hour on this careful shredding job. WHAT are you doing with that light? 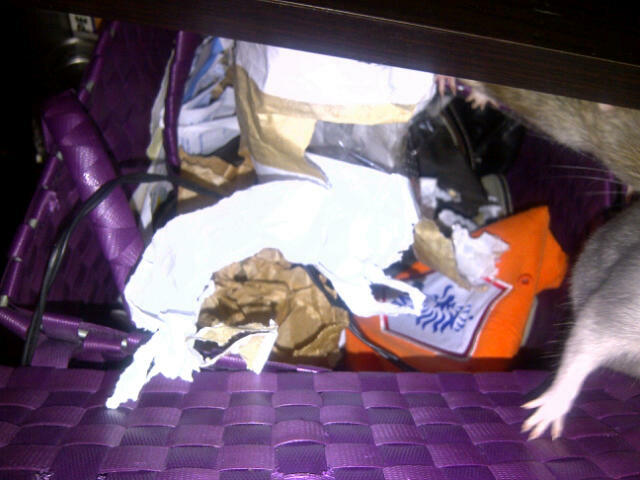 So, I think if Koko ever gets tired of being my pet, she could apply for a job as a shredder. She’d be a star at it really! Oh, and P.S. the good habits post is coming, I just really wanted to post this as it happened just now. WHAT are you looking at? GO AWAY. It’s ALL MINE. Why is it that when I search wordpress for pet-rat blogs it takes me ages to find just 4 or 5, and when I accidentally make a typo and spell ‘cats’ instead of ‘rats’ the number of blogs is overwhelming? It’s just injustice that there are so little blogs about these wonderful and funny critters. Youtube on the other hand, is overflowed by video’s of cage set-up’s how-to instructions or of silly rats sleeping in weird positions. I think video-people might be of a different kind than blog-people. Sad really, because in my opinion, it is SO much fun to read about pet rats. Maybe even more fun than to watch them. I’ll admit, I have a bunch of video’s of my two ladies of mischief myself, but none worthy of posting on youtube, or my blog for that matter. I’d much rather write, write, write. Read an interesting post by Chaoticscribbles (http://hamsterdiaries.wordpress.com/) today about petblogs and how most of them die off due to the fact that they can be too much on one topic. I sincerely hope Chaotic, that my blog will prove you wrong. I intend to keep writing about my two awesome ladies for as long as they live. But I do have to admit that I might not get new ones right after that, so maybe then my blog will die off (I hope not). It’s not just a way for me to talk about all the adventures that take place (and have taken place) in my tiny studio apartment everyday, it’s also a way to keep me writing. Because, as much as I love my ladies, I love writing more. And it is what I need to do. Just 3 days into this blog I already feel happier writing again. So even though I am going slightly off topic from my title, I would also like to thank Sanne (http://suchislifesanne.wordpress.com/) for inspiring me to start a blog about my rats. Who knows, maybe a new blog will floe from it. 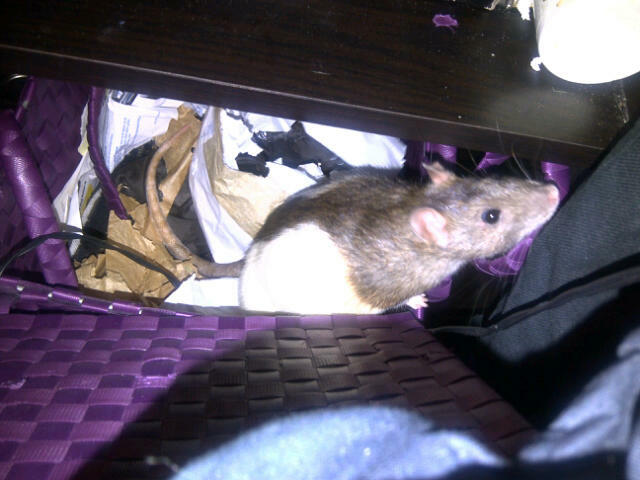 Back to topic though, I wish more people posted about their pet rats. They are wonderful, smart, funny, strong willed animals that are highly trainable and very entertaining (day and night). I have convinced several of my friends so far that they are not nearly as scary as people think they are and some now even allow them to sit in their laps for a bit (Yeah, like my girls are going to sit still for even more than 2 seconds). This post therefor, is a rally for rats. 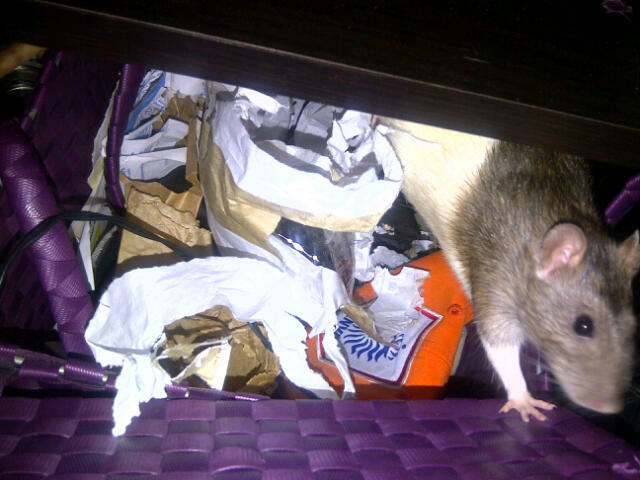 If you like pet rats, if you like my blog (so far), if you agree that rats should get rid of their bad image. Please share my blog as much as you can, with as many people as you can. And please also feel free to share any cool blogs or other things about rats in the comments. I can literally never get enough! Thnx!